British estates were known to be the epitome of cleanliness with their white-glove perfection. Through her meticulous research on servants, Lucy Lethbridge gleaned much knowledge about how these homes were made to gleam over almost two centuries, from the Victorian through the Edwardian years and beyond. The majority of household tasks were done with basic ingredients like lemon juice, white vinegar, and bicarbonate of soda, which feel very modern in their display of frugality and ecological soundness. Tea leaves were used to freshen up rugs and stewed rhubarb to remove rust stains. Here, Lethbridge reveals these old-fashioned and almost-forgotten techniques that made British households sparkle before the use of complicated contraptions and a spray for every surface. A treasury of advice from servants' memoirs and housekeeping guides, and illustrated with charming art from period advertising and domestic classics, Mind Your Manors is the perfect book for all those who want to put time-tested cleaning methods to work. 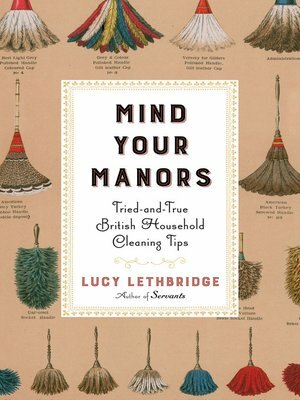 Lucy Lethbridge is the author of the highly praised Servants: A Downstairs History of Britain from the Nineteenth Century to Modern Times and Mind Your Manors: Tried-and-True British Household Cleaning Tips. She lives in London.